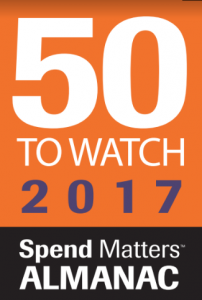 Last week top supply chain and procurement industry publication Spend Matters announced their list for the 2017 Providers to Watch, including Source One Management Services for the second year in a row. This list is the result of careful consideration, discussion and debate among the Spend Matters analysts as they aimed to exclusively feature innovative firms in the technology and consulting space. Source One is honored to be recognized in their 25th year as they celebrate this anniversary in business as providers of procurement and strategic sourcing services. Spend Matters released the list during the annual ISM conference held last week, where Source One partnered with the Institute for Supply Management as sponsors of ISM2017 and exclusive sponsors of sub-conference Exec In. The list is notorious for being a reliable resource of prominent procurement technology and service providers that annually supports enterprises as they go through the process of researching vendors and eventually selecting the firm best for their organization. As Source One continues to grow and support a variety of spend management initiatives, it exemplifies the qualities that Spend Matters recognized when selecting the firm over other competitors. Some of the highlights from the past year for Source One include the launch of it's spend analysis as a service web platform, SpendConsultant.com. Spend Consultant offers procurement professionals an easy to use spend analysis and cost-reduction opportunity assessment in a convenient setting accompanied by the expertise provided by consultants on the Source One team. The firm is also looking ahead to its eSourcing and reverse auction platform Whyabe.com, which is seeing major improvements to be released in the next year. These developments are just a few of the many examples of Source One's sustained growth as they continue to offer innovative services and solutions for industry leading organizations.